The number sequence 444 is often brought to my attention. 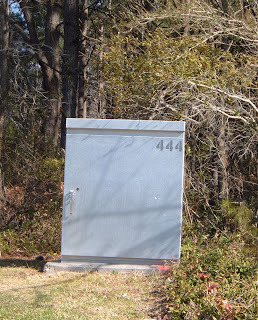 Several months ago at a traffic light on Oceana Boulevard, 444 appeared on this power transformer. It seemed to have an added oomph. 444 is the completion of an important phase. With the advent of Spring, a new season is starting, filled with the resurrection energy. The dormant stage is over and it's time to rise and shine. The Angels are close by and the more I remember to call on them in gratitude, the more I become aware of their loving presence.